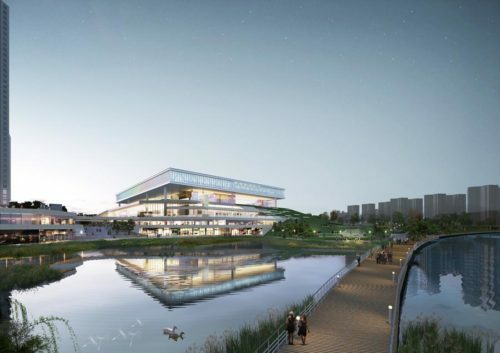 SUWON, SOUTH KOREA — A convention centre is set to open tomorrow in Suwon, South Korea, with the goal of increasing the city’s desirability as a MICE destination. Suwon Convention Center (SCC) comprises a seven-storey convention building and plaza, which features extensive surrounding infrastructure. The building’s seven levels include two floors below street level and five above-ground floors housing a total of 28 meeting rooms. Adjacent to the venue is Sky Park, where attendees can unwind and take in the view of Gwanggyo Lake Park. The building’s hub is its first-floor main exhibition hall, which offers almost 84,000 square feet of space. Longer-term plans call for the addition of a MICE complex featuring a five-star hotel, gallery, department store and entertainment facilities. In addition, SCC is about an hour by limousine bus from Incheon International Airport, which serves Seoul. Already, the venue is attracting groups, having booked 42 events for 2019. Suwon, the capital and largest city of Gyeonggi-do province, is home to two UNESCO World Heritage sites, Suwon Hwaeseong Fortress and Hwaseong Haenggung Palace. The city is a major education and business centre, with 11 universities and multiple international businesses, including Samsung.